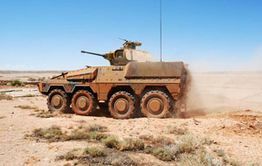 The IFV variant of BOXER represents the leading edge of wheeled Infantry Fighting Vehicles. 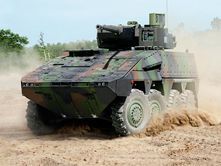 Combining the BOXER inherent high level of protection and the unique mobility with the latest turret technology, the IFV variant presents state-of-the-art capabilities to face current requirements. The IFV variant can transport up to 8 soldiers, besides the driver. A variety of individual modules allows for either a two-man or a remotely controlled turret design – one concept with two configurations. The turret provides a hunter-killer capability, which is unique in a medium calibre turret.